TALLAHASSEE, Fla. – Senior Michael Hall’s 28-hour wait between the end of Friday’s NCAA South Region Championship race and the official announcement of the NCAA Cross Country Championships field was worth it. Hall earned one of 38 individual spots in the field for Saturday’s 10,000-meter race at E.P. “Tom” Sawyer State Park in Louisville, Ky., following his career-best 11th-place finish at the South Region meet. The announcement from the NCAA on Saturday means the Seminole men will be represented at the NCAA Championships for the 17th consecutive season (2001-2017). The Cincinnati, Ohio was forced to wait out at-large team selections before learning his fate. The championship field of 31 teams is comprised of 18 automatic qualifiers – the top two teams from each of the nine regions nationally – plus 13 at-large selections, which are determined after a review of region and regular season results. When No. 28 Alabama failed to earn an automatic berth, finishing third despite a 1-2-4 finish by its runners, Hall’s fate rested in the hands of those making the at-large selections. Only the top four finishers who are not members of qualifying teams in each region are guaranteed individual qualifying spots. Hall was the seventh individual not a member of auto qualifiers Middle Tennessee State and Ole Miss, but moved into the No. 4 spot when the Crimson Tide advanced. “I’m really proud of Mike,” FSU men’s coach Bob Braman said. “He’s been a really good miler and a solid cross country runner for three years, but this year he decided he was going to step up his game. This is an appropriate, hard-earned reward for his hard work. Hall came to the Seminoles as a celebrated middle distance standout and has not disappointed, posting the No. 3 mile (4:03.0) and anchoring the school record distance medley during the 2017 indoor season. He followed up outdoors with the No. 8 1500 (3:43.70) in school history and advanced to the quarterfinals in that event at the NCAA East Preliminary meet. He has built on that success this fall, following a strong summer of training, consistently running among the Seminoles’ top two. Friday’s race at the Harry Pritchett Running Park produced a 10,000-meter personal-best of 30:58.5 for All-Region honors for the first time in four attempts. 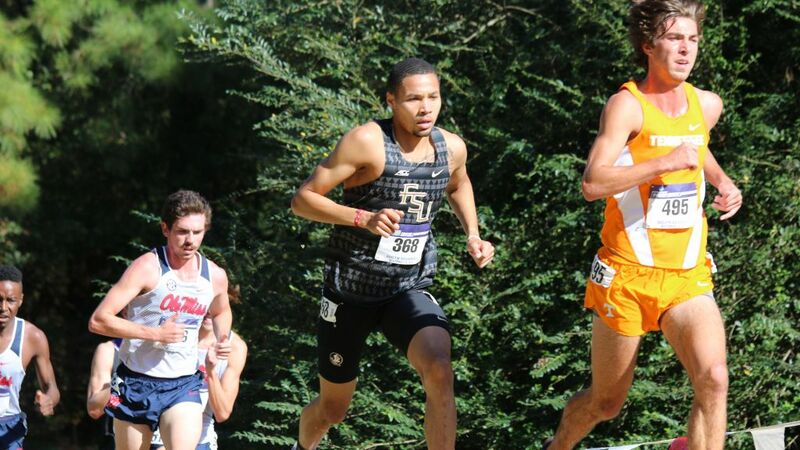 Foregoing his usual measured approach to the start of each race, Hall bolted from the starting line and ran between eighth and 12th the entire way, leading the Seminoles to a fourth-place team finish. And now he’s headed to his first NCAA Championship meet in the final cross country meet of his collegiate career.